A generation ago, IT and digital media were niche skills. Today, they are a core competency necessary to succeed in most careers. That’s why digital skills are an essential part of a comprehensive education framework. Without a national digital education programme, command of and access to technology will be distributed unevenly, exacerbating inequality and hindering socio-economic mobility. Why are we neglecting digital citizenship? Of the three, digital creativity is the least neglected, as more and more schools attempt to provide children with some exposure to media literacy, coding and even robotics, all of which are seen as directly related to future employability and job creation. Likewise, there are major education initiatives – from America’s code.org to Africa’s IamTheCode.org – that promote access to coding education. Digital entrepreneurship has also been actively encouraged, particularly in tertiary education. Many top universities have adopted and developed new courses or initiatives such as technopreneurship and entrepreneurship hackathons to encourage a culture of innovation. We’re even starting to see global movements that nurture social entrepreneurship among children through mentoring programmes – such as the Mara Foundation – and school programmes, like with the Ashoka Changemaker School. But digital citizenship has often been overlooked by educators and leaders. This is in spite of the fact it is fundamental to a person’s ability to use technology and live in the digital world, a need which arises from a very young age. A child should start learning digital citizenship as early as possible, ideally when one starts actively using games, social media or any digital device. So what skills should we be teaching our children as part of their digital citizenship? In the research we’ve done on this matter, we’ve identified eight in particular. A quality digital citizenship education must include opportunities for assessment and feedback. The assessment tools should be comprehensive as well as adaptive in order to evaluate not only hard but also soft DQ skills. Ultimately, such assessments should serve as a means of providing feedback that gives children a better understanding of their own strengths and weaknesses, so that they may find their own paths to success. Ultimately, national leaders need to understand the importance of digital citizenship as the foundation of digital intelligence. 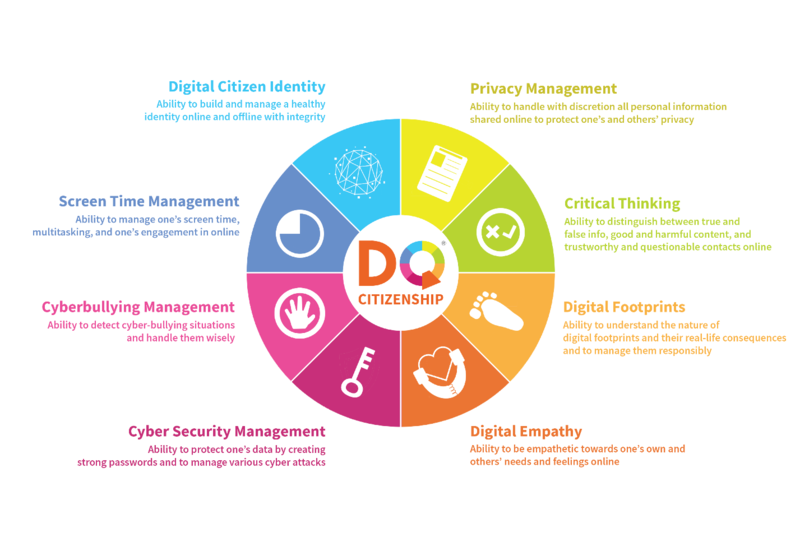 National education leaders should make it a priority to implement digital citizenship programmes as part of an overall DQ education framework. Most importantly, individuals should initiate digital citizenship education in their own sphere of influence: parents in their homes, teachers in their classes, and leaders in their communities.